We are proud to pair our beautiful, single origin, handcrafted SYPCOFFEE with offerings from the family run, Piper & Leaf Artisan Tea Company. 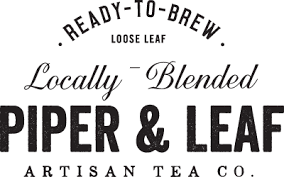 Although they had us at hello with our very first cup, our visit to Piper & Leaf's operations in Huntsville, AL - where we learned how they rely upon local farmers for their fresh fruit and herbs that, with their teas sourced from Sri Lanka, India, China, Japan and Africa, are washed, chopped, dried and blended right there onsite (the aroma alone in their facility is intoxicating!) reinforced our desire to collaborate with their incredibly passionate team. We hope these teas with their incredibly apparent flavor notes, brings as much of a smile to your recipient on their special day as it does to us with each cup. To learn more about Piper & Leaf's exceptional offerings, click here.